I was sitting in the chair with my phone while Eddie watched Curious George before bed. Out of the corner of my eye, I saw Charlie sneaking behind the coffee table on my left. Of course I don’t think anything of it…other than perhaps in about two minutes I would be changing a dirty diaper…and I keep concentrating on Words With Friends (I mean, what do you do with 3 A’s, 2 I’s, a T and a J?). Suddenly, there was a curly-haired stage diver dead-weight free-falling onto my lap. Charlie had climbed up next to me on the table, stood up, and let himself “trust fall” (face forward) at me faster than I could say, “Hey, we don’t climb on tables.” In fact, I think I only got out the, “hey we d–” part before he was plummeting toward my lap. “BIRD! WHAT ARE YOU DOING?” I gasped, sure that he was milliseconds away from crying since I was pretty sure his head hit the chair arm and his gut landed squarely on my elbow. He rolled off me onto the floor in a fit of giggles. His too-long hair (“He looks like a dirty hippy,” Cort is always saying), was flopped into his eyes and his right foot was not in the footsie part of his jammies. 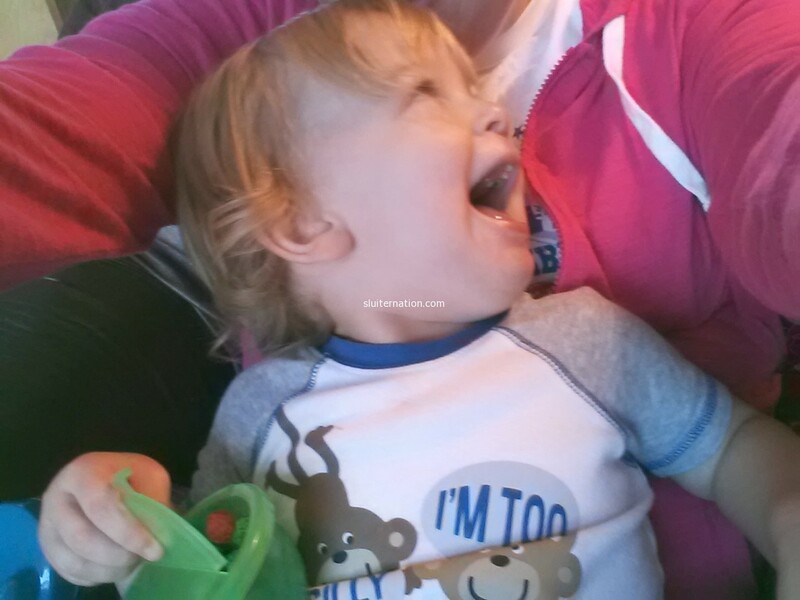 He was sprawled out on his back at my feet, and he was laughing his crazy little head off. “I caught the tail end of it,” he said shaking his head. He furrowed his brow and pouted his lips and shook his little finger at me. “NOOOO. No. NO!” He said sternly to me. And with that he bent down, collected his Pipey and his Puppy, and rubbed his eye with the back of his chubby little fist. Then he turned and flung his face to my lap and made some tired sounds, “mmmm ma ma ma mmmm”. I scooped him up into my lap where he pressed his face into mine and shook his head. That is his way of cuddling. Of showing you he wants to hunker down and be your cuddle buddy for a while. He is my fearless child. 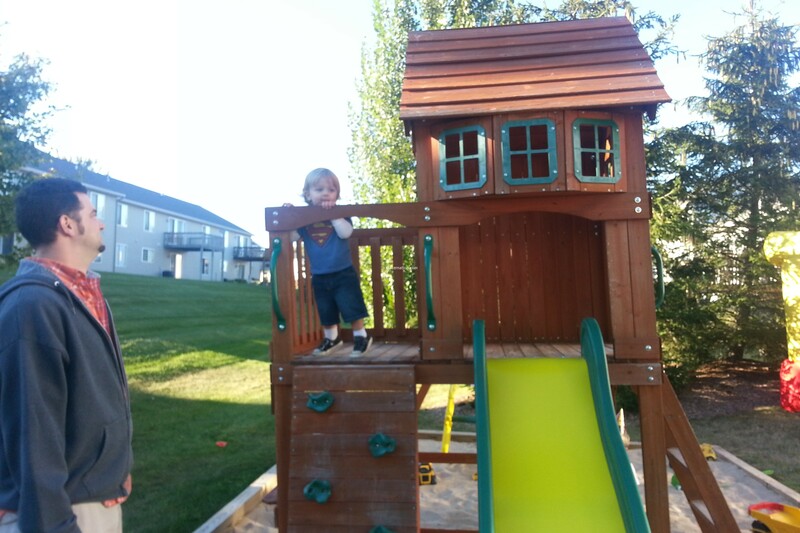 He will climb anything, heights be damned. He may fall a time or two, but he doesn’t dwell on it by crying, and he the fall doesn’t keep him from doing it again. He trusts completely that we will catch him, and if we don’t, no big deal. But if we do, he smiles with his whole face…his whole body even. And his laugh fills the room.